When Conservative Students for a Better Tomorrow asked professors at Furman University in Greenville, S.C., to participate in a Creationism debate modeled after the Ken Ham-Bill Nye event last month, the professors not only refused, but allegedly mocked the idea on social media. A student reported that a professor even threatened the group via email for reporting what the students saw as "bullying." Warning his colleague Bryan Bibb against appearing in the debate, Religion professor Roger Sneed commented on Facebook: "They're seeking you to give legitimacy to a completely [expletive laden rant redacted] load of foolishness." English professor Margaret Oakes advised him similarly, and said, "Don't dignify the stupidity by acknowledging it." Lauren Cooley, a CSBT advisor, told The Christian Post on Thursday that as soon as the professors heard the group's plans to invite Answers in Genesis lecturer Terry Mortenson, they attacked his ideas and the students' desire to invite him to campus for a debate. "The comments on Facebook were definitely bullying," Cooley said. "It's really inappropriate and unprofessional. ... We want to expose the fact that we're being ridiculed." Cooley told CP that roughly five professors were involved in the alleged bullying on social media, but she only named three – Bibb, Sneed and Oakes. "When we exposed the Facebook posts, one of the professors involved threatened a student by email," Cooley said. She alleges that the professor accused the student of violating their privacy and threatened to report the student to campus authorities. Cooley also commented that professor Bibb's unwillingness to support the group's event was "outlandish," but admitted that she's aware that he doesn't agree with Young Earth Creationism, a belief espoused by AiG. Despite the professors' ridicule and unwillingness to participate in the event, Mortenson addressed the students at Furman Wednesday night. Cooley reported that the turnout was "just shy of a hundred, with 96 people in attendance," which she described as "a good turnout" for a small liberal arts college with roughly 2,700 students. Mortenson gave a lecture on his Young Earth viewpoint, Cooley said, and the event was even attended by a few atheists, whom she said only attended to disrupt the event and ridicule his beliefs. Cooley said, however, that she's glad the atheists were there, despite the disruption they caused. "Hopefully they'll keep their minds open. They show up to laugh, but they also hear a different opinion," she said. None of the professors who ridiculed the event on Facebook attended the lecture, according to Cooley. Professor Sneed did not return The Christian Post's requests for comment about the event and remarks posted on Facebook. Because CSBT was unable to recruit a Furman professor for the event, students did not receive academic credit for attending. Although Cooley said this fact doesn't bother her, she mentioned that Furman students have received credit for attending less academic events, such as lectures given by a drag queen and a political cartoonist who sharpens pencils by hand for a living. "The university denied credit for the Creationism event by denying Mortenson's credentials," she said. "It's sad because Furman tries to make the argument that it would sponsor a creationist who had academic credentials, but Mortenson has a PhD in the history of geology from Coventry." Jay Richards, senior fellow at The Discovery Institute and co-author of The Privileged Planet: How Our Place in the Cosmos Is Designed for Discovery, told CP on Thursday, "It's absurd when professors at a university use their power to try to stop student-sponsored debates on subjects with which the professors disagree." "Such actions exhibit a weird combination of hubris and cowardice," Richards commented, adding that the professors seem confident in the truth of their position, but unwilling to risk debate. 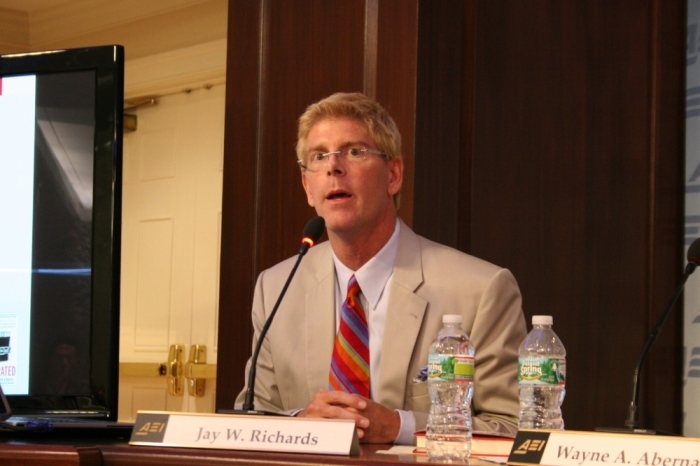 Despite his disagreement with the ideas supported by AiG, Richards believes there should be opportunities for debates about this issue on college campuses. "I'm not a Young Earth Creationist, and disagree with some of the views of Answers in Genesis, but that's not the point," he said. "There should be more, rather than fewer, debates on university campuses." "If they think the evidence against creationism is so compelling, why not simply take the debate as an opportunity to survey that evidence?" Richards asked.